This listing is for one (1) CUSTOM CREATED pair of earrings, detailed with stamped by hand inscription! What is seen here are but a sampling of what I can do. The possibilities are endless. Choose your "word", mantra, prayer, inspiration, or anything that is uniquely YOU. Tell me me what you want, and I'll #stampdat for you! BE SURE TO LEAVE A NOTE UPON CHECKOUT WITH THE DETAILS OF YOUR REQUEST. 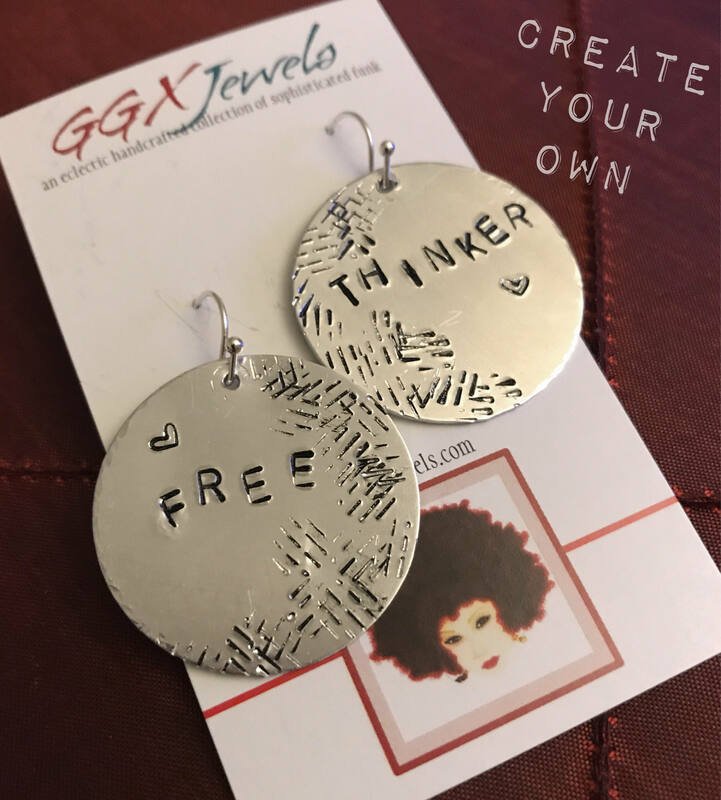 Earrings come in various styles: disk, cut out disk, tag, and rectangle dangle. Additional info: I currently work mainly with hypoallergenic non-tarnishing anodized aluminum wire (silver, as pictured). Goldtone and copper available via CUSTOM ITEM REQUEST ONLY, for 24.50. Please convo me if interested. Very limited supply. Bangle bracelets and necklaces also available via a separate listing. NOTE: Due to the fact that these are custom made to order - please allow approximately 5 days for your order to ship! My earrings came out perfect! I love GGXJEWELS and highly recommend this vendor, you won't be disappointed.